The Mojave Desert is bordered by the Great Basin Desert to its north and the Sonoran Desert to its south and east. Topographical boundaries include the Tehachapi Mountains to the west, and the San Gabriel Mountains and San Bernardino Mountains to the south. The mountain boundaries are distinct because they are outlined by the two largest faults in California – the San Andreas and Garlock faults. The Mojave Desert displays typical basin and range topography. 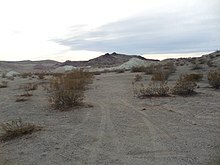 Higher elevations above 2,000 ft (610 m) in the Mojave are commonly referred to as the High Desert; however, Death Valley is the lowest elevation in North America at 280 ft (85 m) below sea level and is one of the Mojave Desert's most notorious places. The Mojave Desert occupies less than 50,000 sq mi (130,000 km2), making it the smallest of the North American deserts. This page was last edited on 24 April 2019, at 15:58 (UTC).